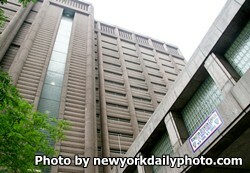 Manhattan Detention Complex is comprised of two buildings, a North Tower and a South Tower. The two towers are connected by an elevated enclosed walkway. The South Tower was formerly known as the Tombs/Manhattan House of Detention. Currently this facility houses 898 adult males. The majority of inmates at the Manhattan Detention Complex are awaiting trail in Manhattan. During their initial arrest and first days at Manhattan Detention Complex, inmates will undergo the intake process.